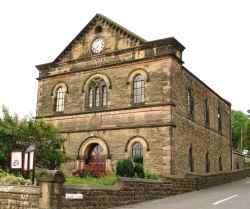 To help you learn more about us, here is a brief summary – Crich Baptist Church is an Independent Baptist Church in Derbyshire, situated in the heart of England. We are Reformed and Evangelical in doctrine, strongly believing in the sovereignty of a great and awesome God, and teaching what have been called the Doctrines of Grace. Amongst other things, these teach that salvation is by grace alone, in Christ alone, through faith alone! We believe the Bible to be God’s revealed Word to men and women. We consider it to be infallible and inerrant, and to us it is our sole rule of faith and practice. We believe strongly, that as much God enables us we are called upon to lovingly commend Christ to all, and with God’s gracious help we endeavour to preach the Gospel of God’s redeeming love, urging sinners everywhere to repent of their sins, and believe that only by turning to the Lord Jesus Christ can they obtain salvation, finding in Him true mercy and forgiveness. We seek to play our part in fulfilling the Lord Jesus Christ’s Great Commission, by having mission interests not only locally, but also supporting missionaries and Christian workers in several different countries. At Crich Baptist Church we also believe that God would have us “earnestly contend for the faith which was once delivered unto the saints”! (Jude v3). With that compelling injunction placed upon us we will stand for the truth of the Bible, in that we will do what we can to warn against and combat error, creeping liberality in the wider church, and uphold such doctrines as a literal 6 day creation, as taught in the Book of Genesis. We also believe that the Bible teaches that marriage is between one man and one woman, and to teach anything else goes against what God has so clearly revealed in the Bible. Are You Looking for a Spiritual Home? The members and congregation at Crich Baptist Church believe ourselves to be a friendly, warm-hearted and welcoming people. So if you are looking for a spiritual home, and church to settle in, do come and visit us, we would love to have the opportunity of getting to know you. We invite you to click on the links in the ‘About Us’ drop-down menu, which will explain more about us here in Crich, and the sort of things we do together as a local church in this rural area of Derbyshire.